This a great point Chris, thank you for bringing up an important matter like this. We have long forgotten what social is supposed to mean. I hope we will go back to the root of the term soon. Thank you, Elly. I hope to post ideas and tips to help out and encourage positive interactions here on GII Life. You don’t have to be a narcissist to use social networking. Reading books and articles on the subject of social media makes it sound like social networking is mostly a tool for marketing yourself or your business. Contrary to what you might be hearing, the best thing about social media isn’t that it’s a way to make some fast money, get free advertising, or brand yourself as a thought leader in your industry. It might be useful for doing some of that, but the most important thing about social media is that it is a very handy tool for socializing with other people. And that is exactly what society needs today. People being more social. Social media is not just a place to talk about yourself. If you were attending a party, would you spend the entire evening talking about yourself? Would you ramble on incessantly about articles you recently read? Would you work the room in such a way that you built a crowd of people listening to you paying little attention to them? I hope not! If you did you would be considered rude by most people at the party. But that’s how some people use social media. They make it more about themselves than about other people. Socializing has value in more ways than just getting attention for yourself or for keeping you from feeling bored and lonely. People are wired to be relational and to “do life together.” Social media provides a convenient and fun way to do that. It seems society is changing for the better, because social media is keeping us from living lives of quiet separation. It’s not popular to bowl alone anymore because social media is bringing us together. Even when we can’t be physically together I can enjoy relating to you as you bowled a 300 game. (Or, at least saying you bowled one.) In fact, the entire planet can read along as you gloat about your high score. Social media interactions are changing how we relate to one another and to our governments. The 2008 elections changed political campaigning forever, now social networking is as much a part of political campaigning as traditional town hall meetings. It is changing how we use media. Now you don’t just read articles by your favorite reporters, you can write back what you think about what they reported. Social networking is transforming how we meet-up in the real world. Researchers estimate that up to 20% of marriages today began online. 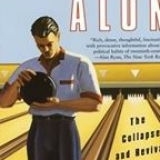 Dr. Putnam’s “Bowling Alone” theory is now out-of-date because almost as soon as his book was published, the social media revolution started. Due to the advent of social networking sites, civic and social involvement is in revival. If you don’t believe social media has the power to chance entrenched society, sit down with a few of the former politicians who have seen Twitter and Facebook used to yank their thrones out from under them. You can sit down with them because they may be working at a Starbucks now, they lost their jobs. Social networking sites have brought people closer together to their long-lost friends, distant family members, high school and college alumni, business colleagues, and even their favorite celebrities. We cannot be in the middle of a decline of social interaction if Facebook boasts 500 million users and Twitter consists of nearly 200 million people. Something else is going on. The world is becoming a more closely connected place and social media are at the forefront of developments in this change in society. At the back of the line of these social changes are the people who can only see social media as a place to satiate their egos and talk themselves up. The people who are changing the world are not a bunch of self-serving narcissists, they are people-oriented leaders. People are starting to come back together to talk about life. We live in an exciting time, we live in the days of the flowering of socialized media.